There was a thread over at Splitcoast a few days ago asking what you would differently in papercrafting if you had the benefit of hindsight. 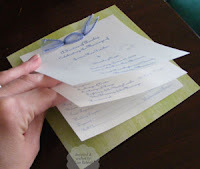 Many, many of us said we would not purchase "cheap cardstock" - the kind that is flimsy and won't stand up when you use it on a card or just looks, well, cheap on a scrapbook page. I've also bought some white-core cardstock that I didn't realize was that way. Then when I scored it for a card, ick! 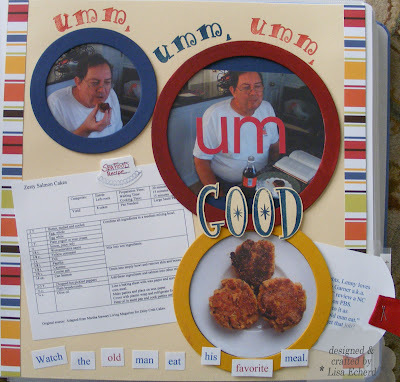 journaling on scrapbook pages as shown above - this is how I got started using this type of paper for crafting and just kept going and going. white matting for photos or card designs - Often my white mats are in between the photo and the next color of matting so it never looks flimsy. 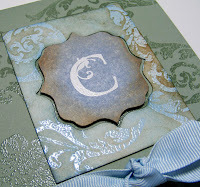 stamping when planning to heavily color and distress the paper as in these notecards. The "C" and the paper beneath it both started out as plain white office supply store cardstock. a base for sewing papers together. I cut and glue my papers to the white carstock and then stitch through all layers. anywhere I need another layer or paper to add weight or hold everything together. as a money saver for larger quantities of items. For example, I used this type of paper for my stepdaughter's wedding programs. I backed the programs with a thick designer paper but the bulk of the content was printed on this white paper. Inexpensive and much easier to punch through for threading the ribbon. A pack of 250 sheets costs $15 - $17. Be sure to look for one that says "Acid Free." Thanks for visiting for today's TIPsy Tuesday. Hope you have a great day!